We combine our Blue Planet intelligent automation software with a wide range of professional and consulting services and a broad partner ecosystem to provide proven solutions that address your most pressing business challenges. Whether you’re interested in automating a physical or virtual domain, or service, our solutions are dedicated to helping you meet your specific business objectives. They optimize and build efficiency around three interconnected IT and Network processes that are crucial to successful business operations: Plan to Build, Order to Service, and Trouble to Resolve. Enterprises, content providers, data center operators, mobile operators, and retail service providers all want to have the right capacity between the right locations at the right time, easily and cost-effectively. With Blue Planet, network service providers can automate provisioning of bandwidth on demand services—giving their customers the flexibility to adapt to market demands quickly. Using a self-serve portal, customers can dynamically adjust their bandwidth: how much, where and when they need. 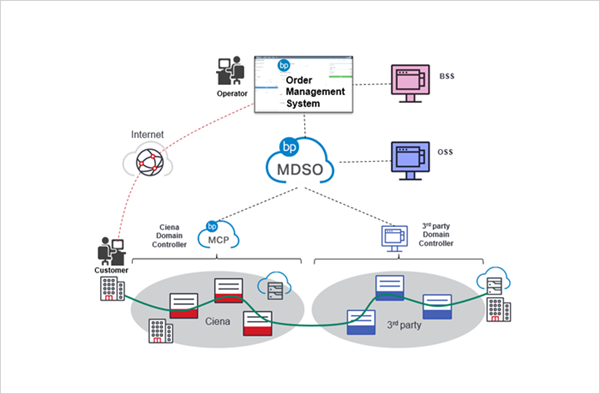 Behind the scenes, the many steps involved in the service fulfillment process are greatly simplified, thus reducing manual effort and total OPEX for the network service provider, and decreasing the time interval from quote to cash. SD-WAN is a rapidly growing use case for SDN in the enterprise WAN. For service providers, it provides the opportunity to deliver a highly compelling, new managed service offering that complements ongoing SDN and NFV initiatives. SD-WAN is an overlay technology that helps service providers dynamically program enterprise connectivity using a 'hybrid WAN' model, passing traffic through the most optimal paths based on network conditions and QoS requirements. The hybrid WAN comprises IP/MPLS and wireless and broadband Internet and leverages available broadband access links-such as DSL, PON, and LTE-provided by a physical or virtual CPE. Blue Planet enables you to rapidly onboard and orchestrate multi-vendor SD-WAN solutions and combine them with cloud, NFV, and WAN resources to meet your enterprise customers' private networking needs. Today’s WANs are composed of multiple layers and technologies that use several generations of elements from different vendors. This makes it difficult to manage services delivered across the network, due to the vast array of vendor-specific management systems and protocols used to configure and provision them. Blue Planet breaks down these silos by providing a vendor-agnostic abstraction layer that hides the complexity of underlying networks and elements to drastically simplify end-to-end services provisioning and delivery. For many businesses, moving to the cloud provides a number of benefits including operational agility and cost savings. Today, many service providers are offering cloud connect services where businesses are provided access to a wide variety of public cloud service offerings, often in combination with network services. Blue Planet helps automate the provisioning of diverse cloud and network resources for connecting your customers to this cloud ecosystem quickly and reliably. Your customers can specify their requirements such as speed and bandwidth, through a single self-service portal, with on-demand connectivity and end-to-end service visibility to multiple clouds and cloud providers from any location, whenever they need it. Enterprises are now frequently choosing many of their IT components 'as a service' to reduce costs, scale up or down dynamically based on need, and respond to markets faster by focusing more on strategic initiatives. Whether it's hardware, software, or applications-or any combination of the three-your enterprise customers want service offerings they can rely on to run their businesses with confidence. With Blue Planet, you can enhance the customer experience through seamless, end-to-end orchestration and lifecycle management of these managed services within your multi-vendor ecosystem. Your customers rely on your network services for their mission-critical applications. Service reliability is a critical component in gaining their loyalty and trust. Blue Planet provides machine learning and predictive analytics capabilities that help anticipate failures-so you can act before your customers are negatively impacted. With advanced end-to-end visualization of the state of the network's health, Blue Planet allows you to proactively keep your network and services running smoothly.